John O'Neils CQ10- Helps convert food into energy at a very basic, cellular level and it is an antioxidant. 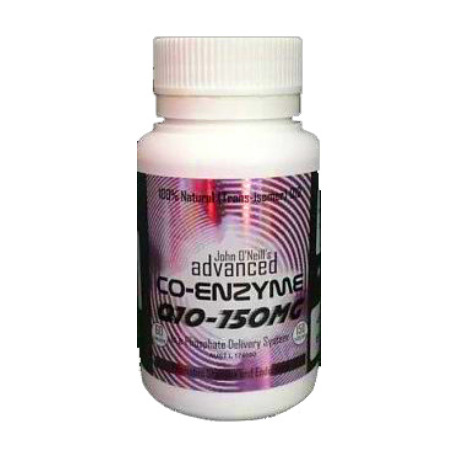 CoQ10 (Coenzyme Q10) is one in a series of ubiquinones, naturally occurring compounds produced in nearly every cell of the body, and was discovered as recently as 1957. 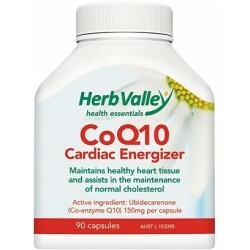 Doctors commonly prescribe CoQ10 (coenzyme Q10) to treat heart disease Canada, and other countries. John O'Neills Advanced Co Enzyme Q10 150mg 60c. John O'Neills Advanced Life, Co-enzyme Q10 is one of the most exciting discoveries of the 20th Century. As well as promoting general health, John O'Neills Advanced Life, Co-enzyme Q10 plays a crucial role in initiating the production of energy in the body and supporting cardiovascular health. Numerous clinical trials have demonstrated the effectiveness of John O'Neills Advanced Life, Co-enzyme Q10 supplementation in supporting vital areas of health. * Improves the heart and circulation in those with congestive heart failure, a weakened heart muscle (cardiomyopathy), high blood pressure, heart rhythm disorders, chest pain (angina). * Treats gum disease and maintains health gums and teeth. * Protects the nerves and may help slow Alzheimer's or Parkinson's disease. * May help prevent cancer and heart disease, and play a role in slowing down age-related degenerative changes. * May improve the course of AIDS or cancer. As science reveals more and more about the human body and nutrition, we are discovering that there are a number of previously unknown nutrients that play a major role in the maintenance of our health and energy levels. 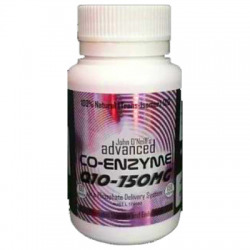 Coenzyme Q10 (CoQ10) is an essential nutrient with a wide range of applications for human health. It is present in every cell of the body and is absolutely necessary to support key metabolic functions. This nutrient acts as a coenzyme in the energy producing pathways that fuel the body’s daily activity. CoQ10 works in the mitochondrial membrane as an electron acceptor/proton donor, facilitating the process of energy production. The body must continually generate energy to support life from these minute power plants within every cell, the mitochondria. Studies show that oral supplementation with CoQ10 will restore depleted CoQ10 stores in cells and tissues through the mitochondria, where they enhance cellular energy production and sustainability. It is especially abundant in the energy-intensive cells of the heart, helping this organ beat more than 100,000 times each day. In addition, coenzyme Q10 acts as an antioxidant, much like vitamins C and E, helping to neutralize the cell-damaging molecules known as free radicals. CoQ10 has generated much excitement as a possible therapy for heart disease, especially congestive heart failure or a weakened heart. In some studies, patients with a poorly functioning heart have been found to improve greatly after adding the supplement to their conventional drugs and therapies. Other studies have shown that people with cardiovascular disease have low levels of this substance in their heart. Further research suggest that CoQ10 may protect against blood clots, lower high blood pressure, diminish irregular heartbeats, treat mitral valve prolapse, lessen symptoms of Raynaud's disease (poor circulation in the extremities), and relieve chest plains (angina) Multiple studies have investigated the ability of CoQ10 to reduce the lipids that characterize harmful cholesterol build-up. An article in the journal, Atherosclerosis, reported that treatment with CoQ10 reduced the amount of plaque deposits in the coronary arteries and also reduced the incidence of plaque rupture and thrombosis—key events in heart attacks. John O'Neills Advanced Q10 is made from the highest quality raw material using a 12 stage fermentation process. The raw material is derived from several different yeast cultures that are immersed in large saltwater vats that also contain special types of algae. The fermentation process allows the power of the sun to increase negative hydrogen electrons within the enzyme structure of CoQ10 thus it retains the 'LIFE FORCE' of the negatively charged electrons.